Welcome to Iraq and Operation Iraqi Freedom (OIF). OIF is a dynamic, full spectrum operation encompassing both kinetic and non-kinetic operations and is arguably the most complex and challenging fiscal environment in our nation’s history. The dollar amounts spent supporting or are substantial and represent the treasure of our nation. Leaders must know what funding resources are available and how to best apply them in order to gain the maximum operational effectiveness. 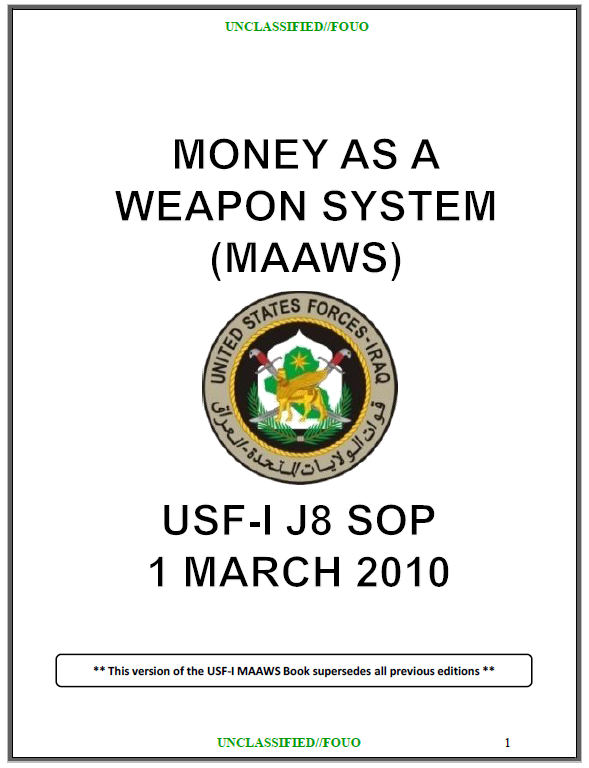 This “Money as a Weapons System” (MAAWS) SOP is published to educate and advise you on how to financially resource operations here in Iraq. It will serve as a financial road map to assist you in navigating the myriad of funding challenges and issues that will arise during your time in Iraq.. recommend you keep a copy readily available, and ensure the appropriate leadership in your organizations has access to a copy as necessary. Resources, particularly money, have a central role In ongoing operations given the effects they bring to bear on the fight Money ii truly a weapons system here in Iraq . . . especially in light of our non-kinetic efforts and the arsenal of supporting financial resources. while the scope of requirements: multitude of legislative authorities: fiscal law challenges: and perpetual contracting needs may appear daunting…they are manageable. The Fiscal Triad made up of resource managers, contracting, and finance teams, working closely with legal advisors to guide and assist… make sure you establish a rapport early on with them as teamwork and communication is Indispensable to success. Accountability and riscal stewardship are paramount as we endeavor to satisfy OIF requirements and responsible drawdown of forces. Towards that end, USF-I has developed and refined several programs, processes and reporting procedures aimed at validating sustainment operations and responsible drawdown requirements. This edition of the MAAWS includes several key changes that provide commanders financial flexibility while maintaining requisite review and analysis, and management and internal controls as we continue to build a “cost culture”. In Responsible Drawdowm of Forces, our biggest challenge is right-sizing requirements for the future U.S. force posture In Iraq. Jointly, we’ve worked several issues with CERP to return to the basics of management controls and commander oversight. Initiatives such as enhanced PPO and PA training and staff assistance visits will continue to strengthen accountability of this highly visible and much needed authority. As always, we are at your disposal to assist as you develop requirements and compete for funding. 3. (U//FOUO) POLICY SCOPE: This Rewards Program SOP applies to all components and forces assigned to or supporting USF-I and operating in the Iraq Joint Operations Area (IJOA). 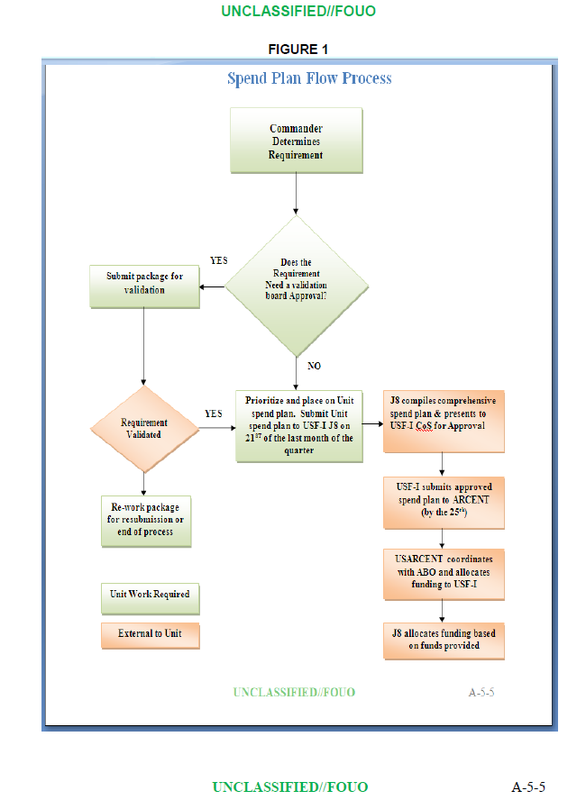 The document outlines the responsibilities and procedures for program duty positions, payment requests and approvals, execution of the actual payment process, reward payment reporting, record keeping requirements, and reward advertising. The intent of the guidelines and procedures contained in this SOP is to implement management controls to guard against fraud and abuse within the program, while avoiding unnecessary restrictions, procedures or administrative burden on the battle space owner (BSO). The Rewards Program should be considered simply as a tool to aid in collecting information or otherwise obtaining non-lethal assistance leading to the capture of wanted persons or weapons. It does not mandate payments.